Baltimore is a city full of rich history that has been well-preserved and represented, making it a great place to visit if you’re a history buff. 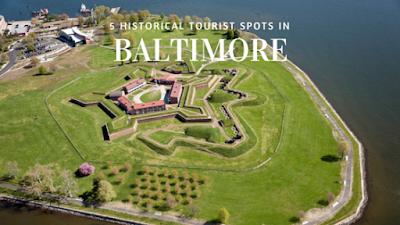 Here are a few historical tourist attractions in and around Baltimore that you and your family should visit while you’re in town for our Baltimore CME conference! 1. Fort McHenry is a military fort situated right on the Baltimore Harbor. It’s most famous for its role in the War of 1812 against the British when it successfully defended the city harbor. An American flag was flown over the fort to signal victory over the British, and inspired one Francis Scott Key to write a little poem called “The Star-Spangled Banner.” You can reach Fort McHenry via water taxi from the Inner Harbor and catch the occasional re-enactment of the fort’s role in the War of 1812. 2. For fans of literature, visiting Edgar Allen Poe’s grave while in Baltimore is a must. Poe’s death remains a mystery to this day, adding to the appeal of the gravesite. Take a tour of Westminster Burying Ground (you have to bring a minimum of 14 of your best friends!) or set up a private tour in advance for smaller groups. You’ll get to tour the Burying Grounds, the Catacombs, and see a fifteen minute film on the history of the grounds and some of the famous Baltimore residents who are buried there. 3. If you love baseball, a visit to the Babe Ruth Museum is in store. The small museum highlights the life (quite literally – he was born there!) of George Herman Ruth and his ascent to stardom as one of the best hitters the game of baseball has ever seen. The museum was just recently renovated in June, giving the building updated amenities and accessibility for disabled patrons. 4. In one of our previous articles about Baltimore, we mentioned the city’s floating museums in the Inner Harbor. One of them is the USS Torsk, a submarine famous for sinking the last enemy ship of World War II off the coast of Japan. Preserved and sitting in Baltimore since 1972, the ship provides a close-up look of the cramped quarters seamen had to endure while out at war. A must-see for war buffs! 5. Mount Vernon is a neighborhood north of downtown that is home to the original Washington Monument which was erected in 1815. Inhabited by some of the city’s wealthiest families, the neighborhood is full of buildings featuring grand architecture and lavish design. The parks around the Washington Monument have been preserved, giving the area a look and feel right out of a history book. You’ll find the Peabody Institute, the beautiful Mount Vernon United Methodist Church, and the Walters Art Museum among other historical spots in the neighborhood. This area of town is a gem for any fan of architecture and United States history. The Charm City is certainly not without sites to see if you’re a fan of history. What are some historical things for tourists to do in Baltimore that you hope to partake in while you’re with us later this month? Let us know in the comments below!